Medical complications and innovation will be the topics du jour at this year’s annual Dr. Harry C. Miller Visiting Professorship Symposium and Reception, to be held on March 2 at the George Washington University (GW) School of Medicine and Health Sciences (SMHS). Louis Kavoussi, MD, chair of urology and head of the Arthur Smith Institute for Urology at Northwell Health, and professor of urology at New York University School of Medicine, will speak at the sixth annual event, focusing his first talk on complications of laparoscopic robotic surgery and his second on navigating new innovations in the field, including robotic surgery and telemedicine. 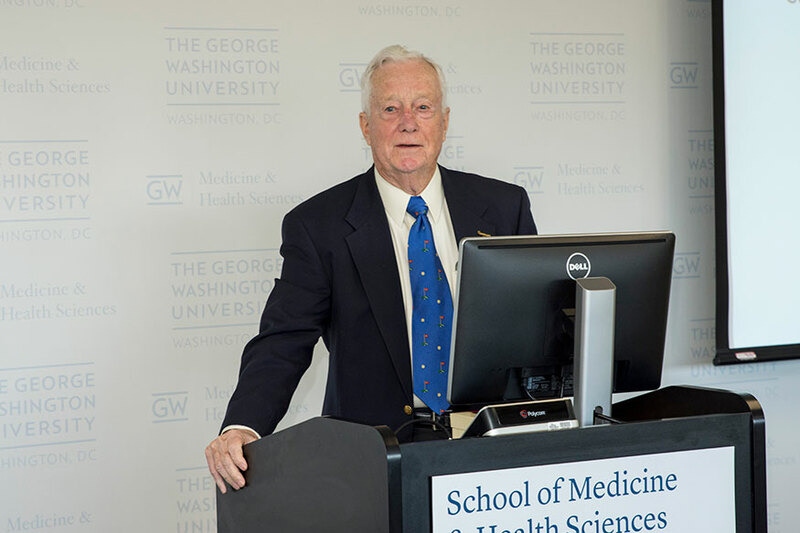 Miller, Professor Emeritus and former chair of the Department of Urology at SMHS, in an interview before last year’s symposium, called having a lecture series in his name a “great honor and privilege.” Miller arrived at GW in 1973 and led the urology department for 22 years. The annual event recognizes his leadership, service, and contribution to the department. In terms of innovation, he said that it’s every medical professional’s duty to move the field forward, and innovation is something everyone needs to know about. The symposium serves as an educational experience for residents, faculty, and other attendees. In fact, residents get the chance every year to present cases to the visiting lecturer and receive feedback on the issues they’ve confronted. Kavoussi said he was excited for that aspect of the event, adding that it’s a “great honor to be able to help the next generation of urologists. It has been about 20 years since Kavoussi has stepped foot on GW’s campus, he noted, and he’s looking forward to seeing old friends, interacting with GW faculty, and furthering the residents’ education. This event is by invitation only. Please contact Natalie Winkelman if you have interest in attending at allgeier@gwu.edu or 202-994-8738.